Relocating to a new church and city can be very exciting for a pastor's wife, but with relocating many hurdles occur, which the wife must learn to deal. The hustle and bustle of moving boxes, new restaurants, shopping places and friends are exciting, but can quickly have a dark shadow cast over them after the moving van pulls away leaving her in a strange environment void of former friends, sights, smells and even favorite grocery stores. All of this hustle and bustle can appear to be glamorous to the average church member, but there is one little factor most people overlook…the challenges and emotions that the pastor's wife secretly goes through to help her husband and family seamlessly transition into a new life. The pastor's wife has a different view from the pew, Windexes the glass house daily, is a master at potluck dinners and feels the need to appear that she has it all together. The cheerleader of cheerleaders, momma to the masses and the forever friend to all is the pastor's wife, and there is a lot that can be done to aid in the health and happiness of this unpaid worker who affects everyone especially if she is new to a church and city. After all, no one's happy if momma's not happy. Seek out positive areas in town, or feel good places, which naturally lift your spirits. Prevent negative attitudes and start a quarter jar. Place two large jars one filled with quarters and an empty jar on the counter and explain to your children they can have the contents of the first jar filled with quarters at the end of the time period. Every time someone says something negative, have them transfer a quarter from the full jar into the empty jar until eventually family members start to think positively. Celebrate with the remaining quarters by getting ice cream. Relocating and regulating your life quickly can be attained with prayer, a good attitude and practical steps, which ensure a successful journey. Take the time to enjoy your new surroundings and new adventure. 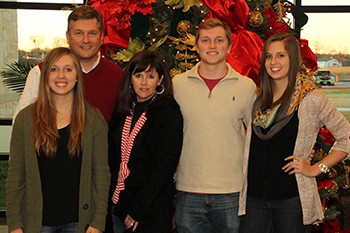 Robin is married to Ronny Marriott, senior pastor at FBC Temple, and they have been in ministry together since 1985. They have three children Molly, an HPU graduate, Morgan, who will graduate from HPU this May, and Ryan, who is a senior at Salado high school and about to go off to college. Robin has been a business consultant for numerous companies through the years as well as an adjunct professor. Related articles: When God says go / God: The “New Thing” Maker! / Do you have Christmas expectations?